The trip down this wild and scenic river offers some of the finest white water rafting in Latin America and takes you past luxuriant rainforest, crystalline waterfalls and dense vegetation covering the sides of steep gorges. It is also an environmentally sustainable adventure that is carbon neutral and supports efforts to conserve the river�s ecosystems and help nearby communities. Once you are picked you up from your hotel, you�ll ride in a bio-diesel bus past lovely mountain scenery to a rustic restaurant where you�ll enjoy a typical Costa Rican breakfast made with organic ingredients. 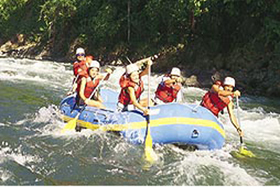 You will then been driven to the Pacuare River put-in site, where expert river guides will give you a quick course in white water rafting and safety before you begin your 18-mile journey down that spectacular waterway. You�ll float past pristine tropical forest populated by toucans, parrots and other birds, some of which are protected in the 637-acre (258-ha.) nature reserve, where the fast-growing trees absorb more atmospheric carbon than the companies vehicles emit, making the tours carbon-neutral. This unforgettable river adventure combines class-II and -IV rapids with floats past breathtaking scenery that includes massive tropical trees and waterfalls that plummet into the river. You will be offered a healthy lunch by the riverbank in a traditional palm-thatch structure owned by a Cab�car Indian family, who recycle the organic waste and wash dishes so that no one has to use disposable plates and cups. After lunch, you will paddle through more adrenaline-pumping rapids and marvel at amazing scenery, such as the narrow canyon of Dos Monta�as. After you reach the highway, you will be able to change into dry clothes before we begin the 90-minute drive back to San Jos�. You�ll also have a chance to purchase carbon-offset certificates, which finance the planting and care of native trees on deforested land that will absorb tons of atmospheric carbon as they grow, and can offset all the carbon that enters the atmosphere during your Costa Rica vacation. Rafters should be physically fit and at least 12 years old, but no previous white-water experience is necessary for this trip. includes transportation, breakfast, lunch at a Cabecar palm thatch structure, equipment, river guide, use of towel at the take out facility in Siquirres.